Rick's Best Gadgets and Inventions Easter Eggs You Definitely Missed Crazy Good Fan Theories All Episodes, Ranked Best to Worst Real Theories & Scientific Principles Every Rick, Ranked by Rickishness Exposing US Education Rick & Bonnie Fan Art Getting All Philosophical Memory-Worthy Quotables Theory: Evil Morty's True Identity Is Doofus Rick the Smartest Rick? This Isn't the Original Morty The Pathetic Life of Jerry Jokes Too Smart for Even You Are They the Same Person? Enviable Tattoos What Else to Watch During the Show's Hiatus Unexpected Emotions Fans Experience Why Is Beth a Total Mess? There are a multitude of reasons Rick and Morty is better than Futurama. That's not to say Futurama is a bad show, but Rick and Morty is simply unrivaled. It is hands down the best animated sci-fi show, and arguably one of the best shows on television, period. What makes Rick and Morty so special is its deceptively intelligent writing. For example, real science is actually explored in Rick and Morty; some entries feel more like a graduate-level course than an episode of an animated comedy. The writers use real-world knowledge to subvert television norms that audiences have grown accustomed to, and the result is one of the best half-hours of television you can enjoy today. This list offers a collection of reasons why Rick and Morty is the best animated comedy of all time – and by default, better than Futurama. Read on and cast your vote in this intense battle: Rick and Morty vs Futurama. Leela is definitely the most psychologically developed character on Futurama. Given her orphanhood, she has a soft spot for the disenfranchised, while holding a healthy grudge and distrust for all else in life. It's a bit of a shallow dive into a psyche, and frankly, not likely an accurate representation of how an orphan's personality develops and manifests. Rick and Morty, however, dives deeply into the psyche of each character (and almost always to the point of discomfort). Morty is in the height of puberty, wrestling with the very real anxieties that come with it. His sister, Summer, is similarly developing, but with the added tribulations associated with being a young woman. Both are internalizing their parent's marital problems in their own unhealthy ways. Then there's Beth who has some serious daddy issues that she quite realistically is incapable of recognizing (evidenced superbly in "Pickle Rick"), while her meek husband, Jerry, portrays a victim of emotional abuse. And of course there's Rick, who is... difficult to analyze. He's not truly a sociopath, as he can feel, but he's perhaps a perfect depiction of the most intelligent being in the universe. Given his intellect, he is only capable of viewing life through an analytical lens. It often overrides his emotional perspective. Considering his experience with lifeforms across multiple universes, it makes sense that he sees each individual life as relatively insignificant in the grand scheme of things. The only romantic love in Rick and Morty is between Beth and Jerry, and that's trying at best. Conversely, Futurama does have a will-they-won't-they thing going on between Leela and Fry. This isn't inherently problematic, but it's a tired trope that has been done to death. Such a relationship is almost always the central pillar of television narratives: Jess and Nick on New Girl, Jim and Pam on The Office, and of course, Ross and Rachel on Friends. Simply put, it's a very contrived means of making viewers invested in the show. Like most animated shows, Futurama uses continuity, occasionally, when it serves the show's purpose, but it doesn't strictly adhere to continuity rules. Rick and Morty, however, both breaks continuity while simultaneously making itself impervious to it. How does it do that? Through infinite universes, of course. There are infinite Ricks and Mortys, so if there's ever a continuity issue, it can be explained by Rick's interdimensional meddling. There's actually a theory that Rick's current Morty isn't his original Morty. More concretely, in "Rick Potion #9," Rick and Morty essentially turn their entire Earth into a monster-infested nightmare. 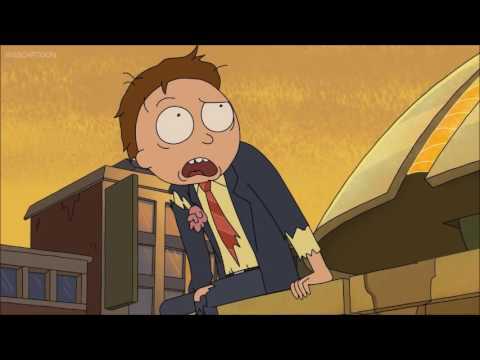 Rick then uses his portal gun to take them to another parallel Earth where he and Morty recently died, so they're able to bury their alternate selves and take their places. One aspect of Rick and Morty that is so innovative yet so logical, is the characters's speaking mannerisms. The characters do not speak in fluid sentences, but rather bumble through, capturing a more realistic level of articulation than virtually any other TV show (not including Decker). This brings an authenticity to the characters, humanizing them. For contrast, consider any Aaron Sorkin-scripted series, where every character speaks a thousand words a minute, spitting out utterly brilliant quips like a super computer analyzes data.